Costa Rica 3 185, originally uploaded by Mic2006. 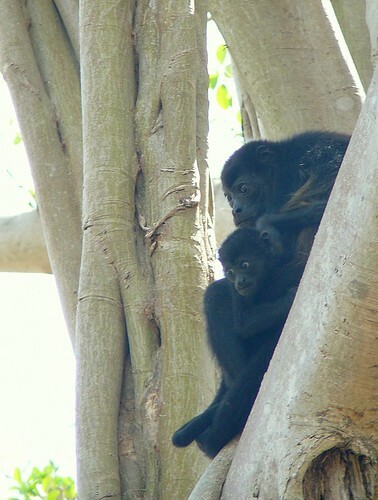 A mother and baby howler monkey in what we came to refer to as “the monkey tree”. One really hot day when Maggie only wanted to relax on the beach I ventured further inland up a dusty road. I reached this tree that must have had about 30 howlers in it. I think it may have been a guanacaste tree that has been enveloped by a strangler fig. The monkeys just watched me until I got really close and then the males started barking. It was insane. 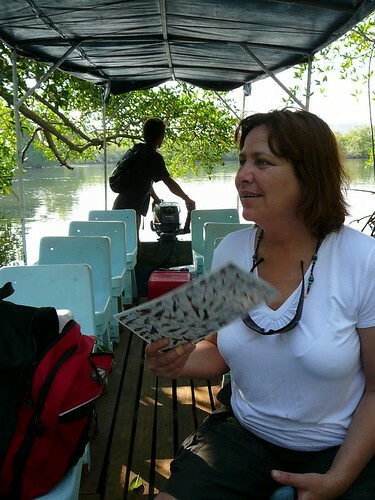 Every monkey within several kilometers took up the cry, you could hear them everywhere. Its quite intimidating. IMG_5031, originally uploaded by Mic2006. It’s odd how you feel this kinship for other cavers and its really exciting when you see one. My wife and I went down to IKEA in Hamilton today to get some bookshelves for all the books my dad just gave me. We took a different route home as the 403 is such a dismal drive. I pointed Maggie up along “Snake Road and when we got to the top of the Escarpment we turned left. The houses were pretty nice along there and what a view! Well the question is why not? 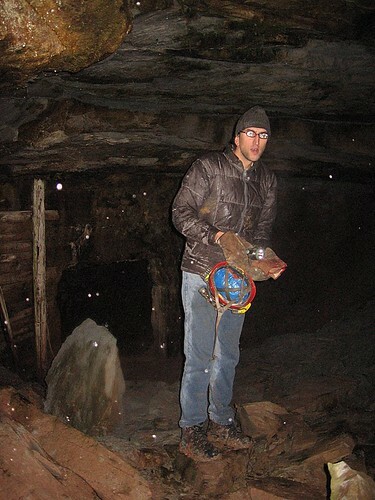 I would wave at other cavers, there are so few of us in Ontario. Is that wierd or is my wife just really unfriendly? 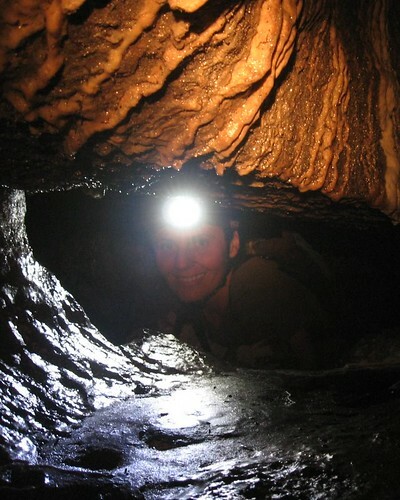 Other Cavers – this lady was on one of the trips I led two years ago. It was a trip to one of my favorite Ontario caving locations. Ontario cave with a scary past. IMG_4403, originally uploaded by Mic2006. The picture is a little blurry but I thought that I would post it today in memory of a time not so long ago when I was able to go outside without my nose almost freezing solid. 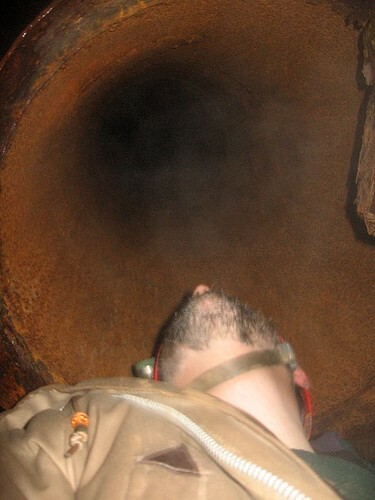 This is Donald of the SQS – a Quebec caving organization. Donald, Corneilie, Marc Andre and I had entered this Ontario cave and we followed it to its sump where there had been an especially harrowing diving accident some years ago. Two divers followed the underwater tunnels inward and only one returned. Fortunately the diver who came back went back to the surface for extra air tanks and then returned to rescue his buddy who had found an airpocket somewhere. 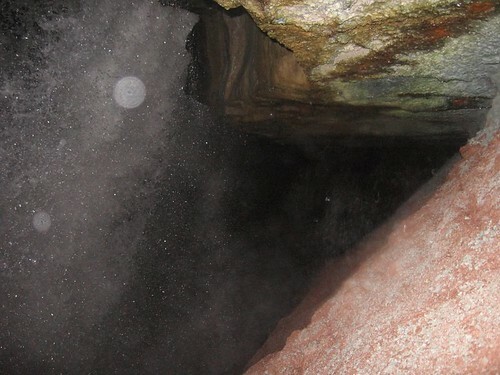 What was especially cool about this cave – aside from the dip at the entrance was the bats. They were fluttering around in the tunnels in significant numbers – possibly leaving the passages by an entrance other than the one we had used. In reaching the furthest extent of the passages I was very interested to see the sandbars which seem re-worked each year. I cant be sure – maybe I was just confused by the map but in retrospect I think that maybe a passage; that is not mapped has been exposed from behind a sand bar. I hope to visit when the weather warms up to be certain. I was reluctant to probe further on my last visit as I did not want to disturb the sediment but with a map in hand I can seperate my confusion from reality. It’s probably just wishfull thinking though. IMG_6100, originally uploaded by Mic2006. This is jeff; his glasses all fogged up from the steam. This is what there was behind the waterfall. It is an old industrial undertaking whereby the water up top was at one time diverted though a sluice down through a tunnel into turbines. This particular spot was one of the first places in Ontario where the power was produced for electric light bulbs. Its pretty historical in my opinion and especially scenic on a winter’s night. IMG_6094, originally uploaded by Mic2006. This is quite interesting – it shows the junction of the Whirlpool Sandstone and the Queenstone shale layer. My good friend SNAFU and I had visited this place on a cold winter night. As we approached falls the noise was totally deafening and the spray and wind was phenomenal. We had to climb up slippery ice slicked rocks in the dark but what an amazing place to visit under those circumstances. Do you know what this is – any idea at all? IMG_6086, originally uploaded by Mic2006. Not so flattering a picture of yours truly but it is indicative of when a long cold winter gets to be too much. I end up going out in desperation and doing strange things. I would be quite impressed if anyone could tell me where and what this is.